Finding a reliable and experienced curtain repair Brighton service provider might look difficult. But worry no more, as PJ curtains and blinds are here to rescue you from getting into the hassle of hiring a certified curtain repairing and installing technician in Brighton. At PJ curtains and blinds, we offer the most exclusive range of curtains, blinds and Venetians that are nearly impossible to obtain at other curtain outlets. We have almost all types of curtains whether you want plain, semi-plain, printed, self-printed, lined, and floral or checkerboard prints, we have it all! The colour range is exceptionally wide with all types of bright, dark, dull and light colours to suit your moods and needs. Other furnishings like blinds and Venetians are also made from good quality fabrics and other materials like Aluminium and cedar (For Venetians only). Our clients are great fans of the materials used in our furnishings like curtain swags and tails and valances, and fabric pelmets. Our services stand out from other curtain stores’ furnishings because of the brilliant tailoring and cuts. We also provide services for installing curtains and blinds, and curtain repair Brighton, providing more convenience to our customers than ever before. Curtains and blinds are installed and handled with great care, taking care of your curtains, curtain railings your house or office walls. The railings are fixed firmly in such a way so that you may not experience any sort of break down, any time sooner. 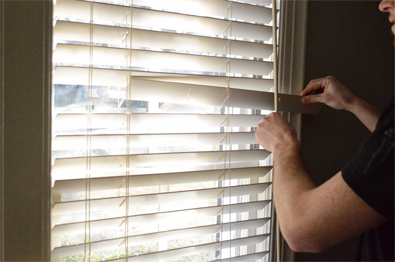 Apart from installations, we offer curtain repairing services in Brighton, making it convenient for the residents of Brighton to avail our excellent services, easily. Nobody repairs curtains and blinds better than us. Whether you have rugged curtains or broken blinds, give us a call and we will be at your place in no time. The best part of our service is that you can avail them at a very reasonable price. Our customers find it amusing to benefit from such exceptional services at such affordable price. Our friendly attitude and our professional performance are guaranteed to win your hearts! PJ curtains and blinds have been in business for quite some time now. We have been able to achieve the trust of our valued customers in such a short time only because of our on-time and economical curtain repair Brighton service. Our clients find our staff to be amicable with a professional approach resulting in customer satisfaction and content!